A University of Johannesburg law professor appealed on Radio702/567 Cape Talk this morning for consumers to wake up to the plight of pregnant pigs in South Africa. Professor David Bilchitz, who is also Director of the South African Institute for Advanced Constitutional, Public, Human Rights and International Law, said many people were rightly outraged at the mistreatment of dogs, yet gave little or no thought to the mistreatment of farmed animals like the pregnant sows in South Africa that were immobilised in metal stalls, allowing no movement forwards, backwards or sideways, for life. Their “abysmal” and “shocking” suffering, he said, was one of the many facets of factory farming that were “immoral”. Professor Bilchitz added that there was a need for consistency in our outrage against cruelty. Around 130 000 pregnant sows produce the 50 000 young pigs that are slaughtered weekly in South Africa for their ham and bacon. Worn out after some four years of breeding, the sows will go to the abattoir never having experienced the ability to trot around or root with their snouts. They will die never having seen a blade of grass or a patch of soil. Your letter could be as follows: Dear South Africa’s pregnant sows are out of sight on the factory farms. But they are not out of our minds. We implore you to introduce a phase-out of stalls in South Africa and keep pace with those countries around the world that have recognised the inherent massive cruelty imposed on pigs by keeping them trapped for life in metal cages. ‘Processor Defends Chicken Reworking Procedures’ – even more reason to stop eating chicken! I often wonder if people who have not ever interacted closely with chickens read these moments of love and adoration that are posted by myself and you (the other chicken lovers on this page) and on our Facebook page http://www.facebook.com/home.php?#!/pages/Chickens-as-pets-not-food-Chicken-Rescue-and-Rehabilitation/101165646600196, and think twice about eating chicken the next time they sit down to a meal? or are curious to know a live chicken better? Surely with all these assumed rational sane people posting testimonials about the joy they get from their relationships with chooks, we have to wonder if we have chronically underestimated these conscious sentient birds as a major food group. I know that in the moments where I am with my chooks and I see them communicating with me and each other, and experiencing very specific emotions, I am horrified at how much they must know at the moment of going to slaughter, or the craziness of being cooped up in a small cage in a battery house. How much they must feel emotionally, and of course there is no doubt that they feel physical pain. In my experience of chickens, I have no doubt that I have seen complex emotions expressed like jealousy, a sense of loss of a loved one, depression, anxiety, anger …. 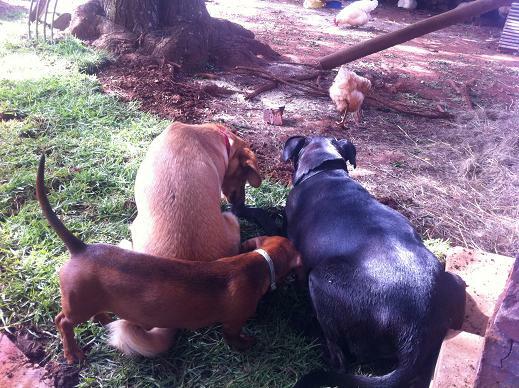 I have also witnessed very clear communication between chickens, and between my chickens and myself. Surely if we are not entirely sure whether we are causing massive physical and emotional harm and torture to a sentient being, we should err on the side of caution, and give up the practice that may be causing this, until such time as we have proof either way. Is this not good business practice in general? Killing and eating farm animals is no longer about an animal living comfortably and happily for some of its life and then reaching a quick ‘compassionate’ end. Killing and eating animals is about factory farming – mechanised and effective daily torture of these creatures and a slow and often drawn out hideously cruel end. Search the internet and watch the videos – these are not trumped-up charges manufactured by crazy ‘bunny huggers’ – these are undeniable facts that are routinely practiced at the majority of big farms and abbatoirs. This is information that is being deliberately hidden from the consumer with non disclosure, ridiculous marketing of pics of happy cows, chickens, pigs etc to continue the existence of a very lucrative meat industry. I recently heard of a restaurant in Cape Town, where they are growing a beautiful veggie garden outside the restaurant. You can watch through the glass walls of the restaurant your veggies being picked for your particular meal, or go and assist in the picking yourself. What a wonderful way to get people to get back to nature, to be aware of what a healthy veggie out of the ground looks like etc. This restaurant does serve chicken apparently – I wondered if you can go choose your chicken, carry it to the slaughter block and watch it being slaughtered next to your table, or assist in the slaughter yourself – I think not. That , I believe, would not be such a popular restaurant culture. It has been a good but busy December at our chicken rescue sanctuary. I had 3 full weeks to spend at the sanctuary checking all our birds, doing a 6 monthly de worm, and pedicures on all the broilers with their damaged feet from poor living conditions before they got to us, and their excessive weight. Their feet were soaked, clipped, picked, pulled, massaged, squeezed, creamed and medicated. All are more comfy, some have a better chance of being pain free than others. this is a particularly poor condition foot. 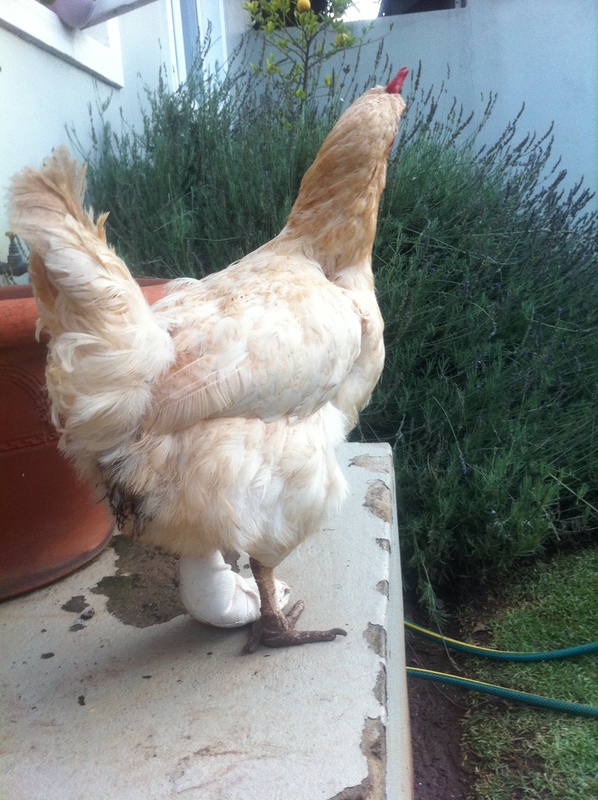 These broilers came to me 6 months ago with bumblefoot. We have euthanased many, and treated as many. We have not managed to clear the infection in any of them. Just too deeply entrenched. Their additional weight does not help either, as cutting or hurting their feet when walking is a reality. They sleep on straw at night, we limit their exposure to concrete floors, and recently we planted additional grass for them so they are always on soft ground. This girls feet are really not good, but she seems to be living a relatively pain free life. We watch them all closely for extreme discomfort or loss of quality of life. This fabulous little man joined us half way through December. 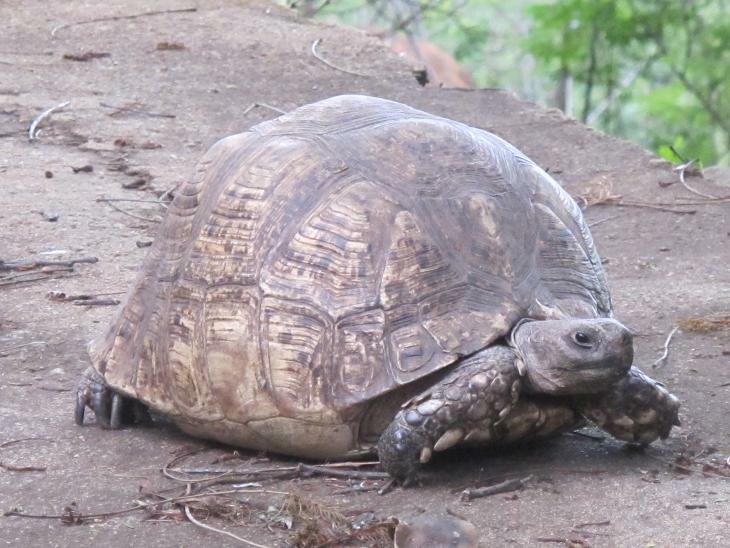 I don’t think he is indigenous to the area of Magaliesburg (any tortoise experts tell us this), and is very bold and tame. I guess he may have been dumped in the Magaliesburg mountains. He arrived outside the kitchen one afternoon. We fed him some fresh veg, and he went off on his wayback into the veld/ bush. Same time next day he was back. This routine has continued. We have named him Ernest. Our two Leguaans were very present around the sanctuary. This tree was sporting a whole host of very large black caterpillars with white spikes (about 10 to 12 cm long each)! This made for good leguaan food. 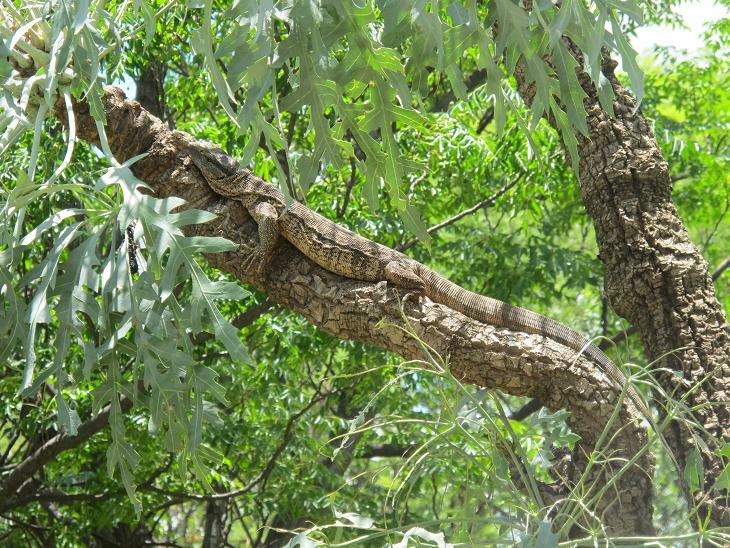 Our chap spent much of his day hanging out in this tree. 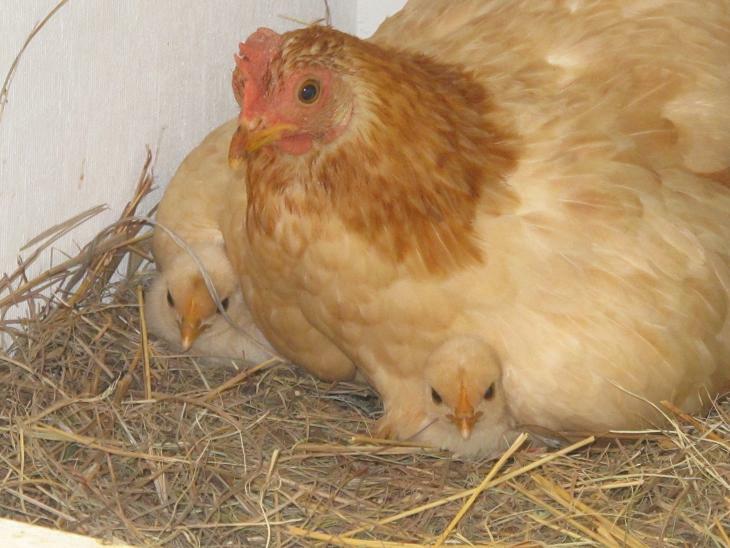 Update on our mum with her two babes (see previous post on them)https://chickenrescueandrehabilitation.wordpress.com/2010/12/06/our-latest-additions-editions/”>https://chickenrescueandrehabilitation.wordpress.com/2010/12/06/our-latest-additions-editions/</a What a great mommy. She is so attentive and protective of her two fluffballs. The fluffballs now have chicken shape, not just round in shape, and are gorgeous. They started coming to take food out of my hand. Mum has been a pleasure to watch. I have loved watching how carefully and skillfully she teaches them to forage for food, protect themselves when in danger, and dustbath. The chicks are now 6 weeks old. They were 4 weeks old in this pic. 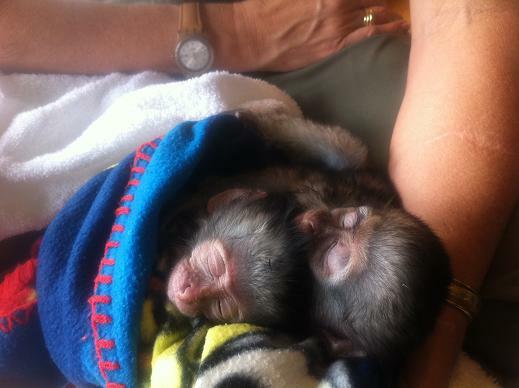 Early December my sister who is a well known wildlife rehabilitator, was asked to care for these two baby orphaned vervet monkeys. They were traumatised, physically hurt, and really sad. With lots of tlc over December, they were ready to be taken in by a surrogate mum vervet and introduced to a semi wild troop. I was privileged to be able to spend a few mornings helping feed, clean and cuddle these two beautiful babes. We had huge amounts of rain over December. Sunday the 19th saw an afternoon flash flood with hail, that had me outside pulling sedentary broilers out of tummy deep water to dry land. Late afternoon saw a massive towel dry of our very wet and miserable hens. 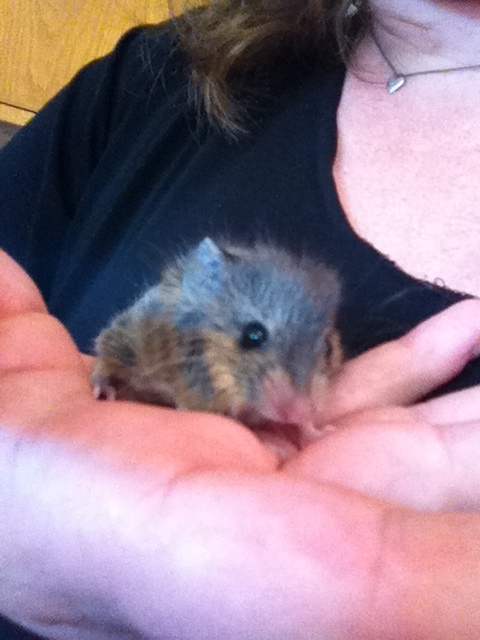 On coming back inside my daughter showed me a bedraggled weak baby field mouse that had dragged itself in out of the rain. 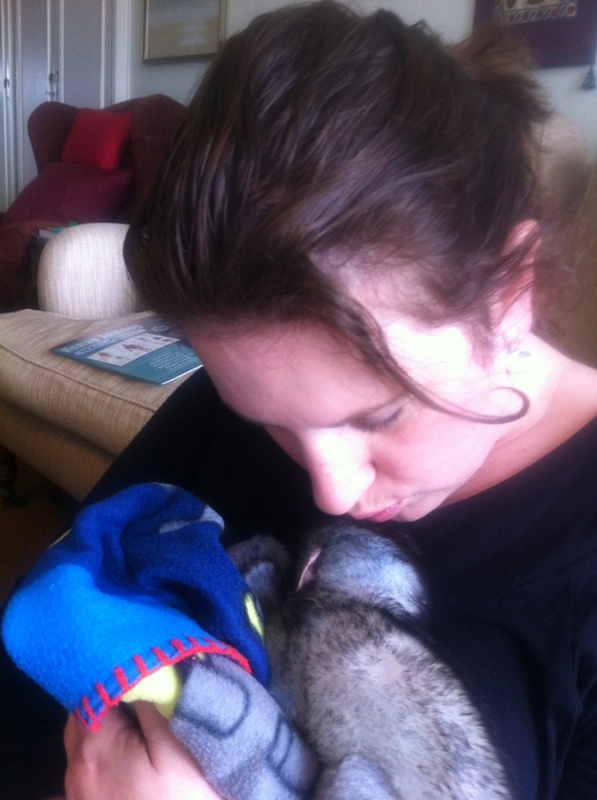 For two days it slept on a hot water bottle, with me doing hourly feeds using an IV gel canula attached to a syringe. I was sure this little creature was going to die. Day 3 saw me lift her out the box to feed. She attempted to bite me and rushed up my arm. Then settled down to have a good 3 ml feed sucking off the end of the canula with no assistance. This was so satisfying. We released her back into the veld 4 days after this, when I was sure she was eating and drinking on her own. We put out seed and fruit daily for another week. My communication around this pic was not great, Cinderella chooses to lay her morning egg squashed into this tiny tupperware. A few very upset chicken lovers commented that this was not a nice laying box for a chicken, and we should provide better facilities for our chicks. 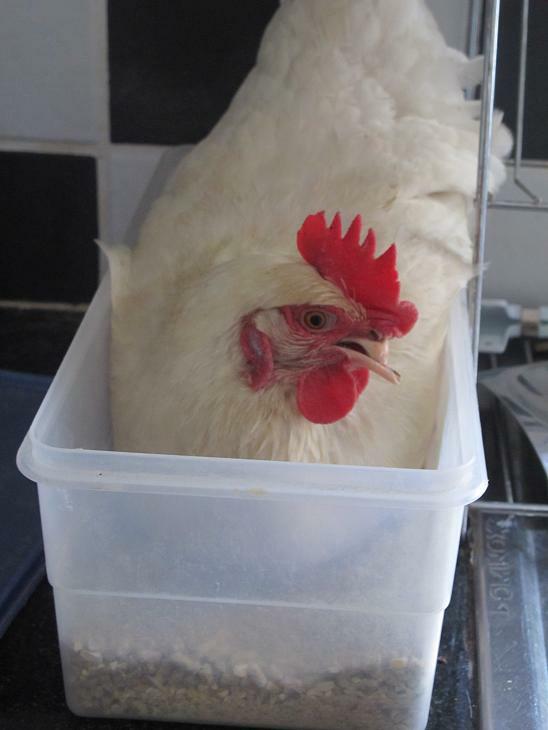 I had to quickly explain that we have wonderful laying boxes, but hens will do what hens will do! This pic was taken at our home where Cinderella lives permanently. Over December she came for a visit to the sanctuary, and found a new place to lay her eggs. 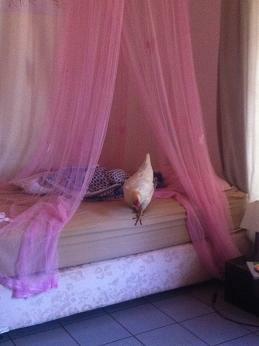 Cinderella laying morning egg on my daughters bed! So, now you can see, we are not that mean to our hens! Melody is our ‘oldest’ rescue. That means she has been at the sanctuary the longest, although may not be the oldest. Melody recently developed bumblefoot in one of her feet. I have been treating her for weeks, and really battling to make headway. After intensive work over December and opening up the pad of the foot to get pus out (which is not recommended as you open up to further infection). However I was desperate. This meant however that she had to have her foot cleaned and bandaged twice a day to keep additonal infection at bay, until the foot healed. Heal it has, and we have finally come right. She was such a patient patient! Calmly let us work on her twice a day, and handled her bandaged foot like a pro. Of course we had our share of heart ache. Two of our broilers died. One had to be euthanased. Her heart was giving in and causing massive respiratory problems. After 3 days of watching her slowly suffocate, I could not leave her to suffer anymore. She was euthanased at the sanctuary. It was very peaceful, and I held her throughout. That was christmas eve. On christmas day, another broiler was looking very miserable. Her colour was bad, and she was very listless. I picked her up, took her inside, and decided to try a course of anti bios. She died in my arms before I could start treatment. Its always sad to have any of our birds die, butI focus on what we have done for them. Their lives have been dreadful at the hands of chicken farmers and their staff – in cramped facilities. 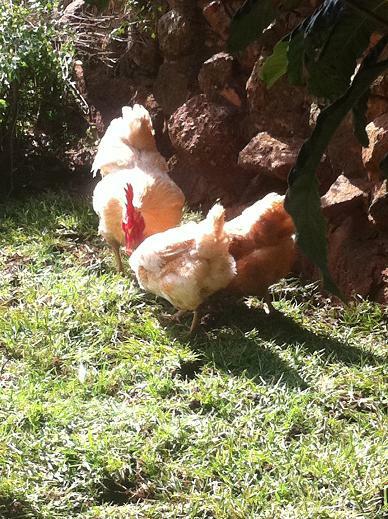 At the sanctuary they get to experience what it is to have freedom, an enabling environment for normal chicken behaviour and loads of love and tlc. This is what we can do for the time they are with us. RIP our beautiful girls.